The Patriots early season success can be attributed to a number of different factors. Not the least of which is the coaching of Bill Belichick, but the play of the offense line has to be considered one of the pleasant surprises thus far in 2016. With the suspension of Tom Brady, the biggest question this summer was, “How will the Patriots fare in the first quarter of the season?” The answer thus far has been, just fine. The team is off to a 3-0 start and like many had envisioned prior to the start of the year, in no large part to the offense leaning on the running game. An even bigger question to me than how would the backup quarterbacks play this season, was how would the offensive line handle being tasked with handling the running game. Especially when the opponent knew the Patriots were going to run. The offensive line a year ago was injury ravaged, of that there is no doubt about that. 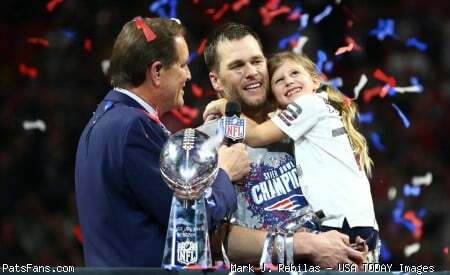 But their level of play overall was poor and Brady was nearly decapitated at times out there a year ago. But the return of Dante Scarnecchia, the return to health of Nate Solder and the addition of Joe Thuney has been a panacea for the Patriots offensive line. Thru three games the Patriots lead the NFL in rushing and the play of the offensive has been markedly improved. The interior three of center David Andrews, and guards Shaq Mason and Thuney are perhaps the biggest pleasant surprise as they’re playing very strong and get better as the game goes along. 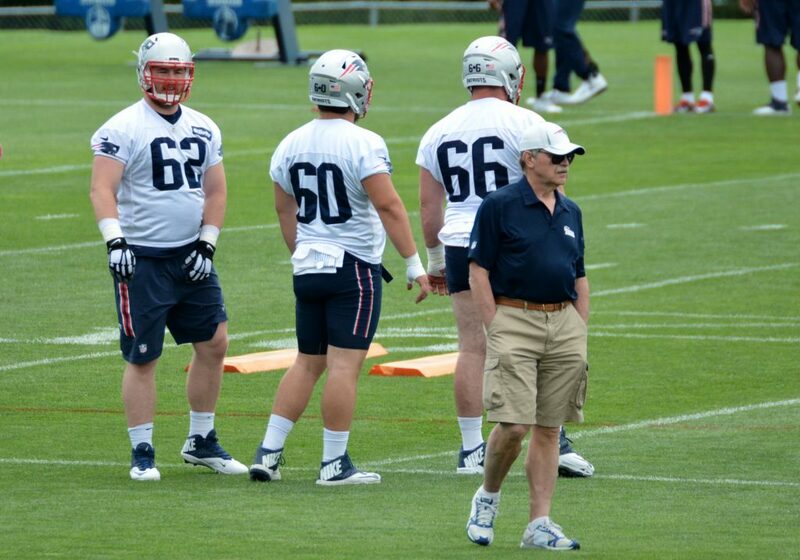 Joe Thuney wants to know “What are Pink Stripes?” Thuney (62) and David Andrews (60) have been solid this year. LeGarrette Blount leads the NFL in rushing attempts (75), rushing yards (298), rushing yards per game (99.3) & is tied for the lead in rush touchdowns (4). “There were a lot of plays — too many plays — last year where it didn’t matter who the back was, we just couldn’t get him started, couldn’t get him into any kind of space, couldn’t let the back build up any kind of momentum,” Bill Belichick said in a conference call with the media after the Miami game. Belichick’s comments are telling because they go against the popular notion that Blount dances too much when he gets the ball. What is he, or any other back supposed to do when there is nowhere to run. We’ve all seen, too often that the Patriots’ backs getting hit as soon as they receive the handoff, often deep in the backfield. That isn’t the running backs’ fault. Blount is on pace for nearly 1600 yards rushing in 2016. While the offense will change once Brady returns from his league imposed vacation, one can’t say enough about the performance and workload that was placed on his shoulders. 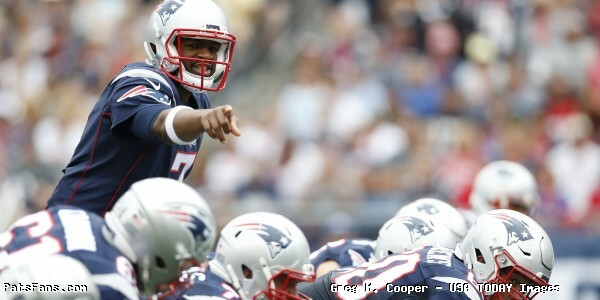 And he’s come through in the clutch for the team, especially in the fourth quarter as he’s been a closer for the team. Two other additions that can’t be overlooked this season has been the play in the running game of Martellus Bennett and James Develin. Bennett has always been known as an excellent run blocking tight end, and it is an area that he has always prided himself in. He and Rob Gronkowski give the Patriots the option of nearly having two extra tackles in the running game. They can also go out on pass routes and threaten the seams. Once Gronkowski’s hamstring is healthy, he and Bennett will be a tough duo to stop. Develin’s value to the running game can’t be overstated. He was really missed a year ago and he is a devastating blocker as a fullback as he leads the way for the backs to follow in the running game. A look at some of Blount’s big runs this season usually entail him following Develin thru the hole and into the second level of the defense. The pass blocking of the offensive line has been better, not great but better this year. Granted they aren’t passing on every down, which actually hurt their level of play when teams could just pin their ears back and come after Brady. They’ll face another tough test in the Buffalo Bills defense this week. The Bills sacked Carson Palmer five times and picked him off four more on Sunday. But dedicating themselves to being able to run the ball and sticking with it has been a feather in the cap of Offensive Coordinator Josh McDaniels thus far this season. McDaniels creative play-calling and game planning has kept opposing defenses on their toes. And he’s able to do that due to their ability to run the ball effectively in 2016. This entry was posted in Patriots Commentary, Patriots News and tagged 53 Man Roster Projection, Bill Belichick, Dante Scarnecchia, Jimmy Garoppolo, Julian Edelman, LaGarrette Blount, Malcolm Butler, New England Patriots, NFL, Patriots, Patriots offensive line, Patriots Training Camp Photos, Rex Ryan, Rob Gronkowski, Rob Ninkovich, Tom Brady on September 27, 2016 by Steve Balestrieri.